Updated photos coming soon. Photos displayed will be similar to the final construction and décor. Kick back and relax in this brand new oceanside cottage. Tight Lines & Tan Lines is conveniently located in northern Kitty Hawk just one-tenth of a mile from the nearest beach access. Since you can simply walk to the ocean in just 3-minutes, it’s easy to work on that tan and keep your fishing lines tight during your entire vacation! There is plenty of parking in the driveway and under the covered carport. In the back yard, go for a morning swim in your private pool and after a long day of playing in the sun, unwind with an evening dip in the bubbly hot tub. Inside, a large recreation room features a billiards table, kitchenette with full-sized refrigerator and elevator access. The kids will love being so close to the game room and will quickly claim the Bunk Bedroom downstairs. A full hall bathroom completes the level. Upstairs, the main entrance to the home can be accessed from the covered front porch. Get a good night sleep in one of two cozy Master Queen Bedrooms with attached full bathrooms or one of two comfortable King Master Bedrooms with attached full bathrooms. A laundry closet is conveniently located in the hallway between the bedrooms. Outside, a covered back deck is the perfect place to relax for those family members who prefer to stay out of the direct sunlight. Your family will spend a ton of time gathered together in the large great room with fireplace, wall-mounted flat screen, and gorgeous ocean views. Enjoy cooking a nice meal together in the modern fully-stocked kitchen with island bar and brand-new stainless-steel appliances and then sitting down at the spacious dining table. A King master suite with full bath is located on this level and has direct deck access. Step outside and enjoy your morning coffee rain or shine on the covered deck or if you’re wanting to soak in the ocean breeze while working on your tan, a sun deck is also available. 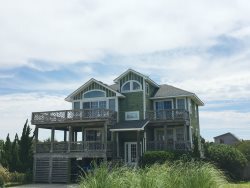 While Tight Lines and Tan Lines has enough amenities to keep you entertained all week, its convenient location means you can explore all the great food and local attractions the OBX has to offer. Just minutes away, the Sea Scape Golf Links course is the perfect place for the avid golfers in your group. The whole family will love taking a stroll through the Kitty Hawk Woods Coastal Reserve to see the natural landscape and awesome wildlife. For a day trip, take the family up to Corolla to see the Currituck Lighthouse and take a safari-style tour to see the Corolla wild horses. When you get hungry, Art’s Place is just a short walk away and is a great place to grab a burger for lunch. For a fine dining seafood experience, walk over to Ocean Boulevard Bistro and Martini Bar. Whether you prefer to hang out around the pool all day or have already made a full itinerary of places to see, Tight Lines & Tan Lines is the best choice for your next Outer Banks vacation.